Photographs by courtesy of The Bushwick Starr. Very few places in Bushwick give me this my-insides-are-all-made-of-cotton-candy feeling like The Bushwick Starr… Ok, ok, maybe I am exaggerating a little here, because Bushwick is, in fact, like a big candy store, and most of the places are simply sweet. However, one thing I know for sure. If Bushwick is a candy store, then The Bushwick Starr is the mildest Belgian chocolate on the very top shelf. And until January 30, you can get a nice Gilgamesh candy! The Bushwick Starr is hosting an arts collective, The Forge, with its theatrical remix of mankind’s oldest tale, Gilgamesh. 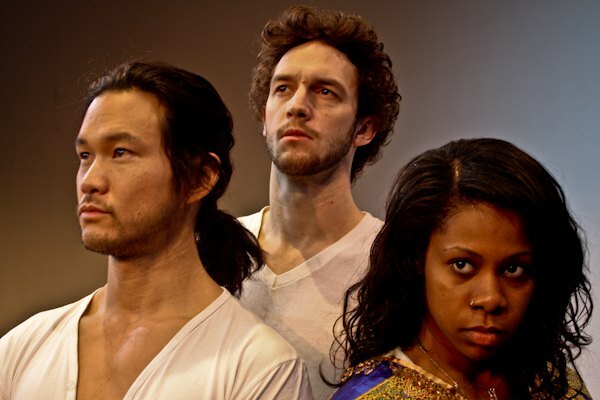 Immortal: The Gilgamesh Variations is an interesting theatrical experiment. Eleven acclaimed playwrights got together, and each of them adapted one of the Asyrian tablet stones that tell the story. The play is dynamic, every 10 minutes the playwright, character choices, style and meaning all change. And each of the 10 actors plays Gilgamesh at least once. If you’re still wondering what to do this weekend, make sure you go and enjoy the great acting in Gilgamesh.